Let me offer this as a question first: where would you play? In the game Black blocked at and White cut at . Fortunately for Black, in the ensuing capturing race, White self destructed and the White stones at the top died and could even be captured before the Black string was. It doesn't require a go genius to see that White cannot really cut. Black should simply play the straight connection at and if White pushes through, his cutting stones will be caught, thanks to the extra liberty at the circled point. This is an obvious case of the proverb the strong player plays straight, the weak plays diagonal but something was nagging in my mind. Despite my analytical abilities and this being a relatively straightforward position, I think chances are high I would have made the same mistake as the Black player in an online game of mine. Why is it that the first diagram, though clearly wrong and poor style, is so instinctively tempting? 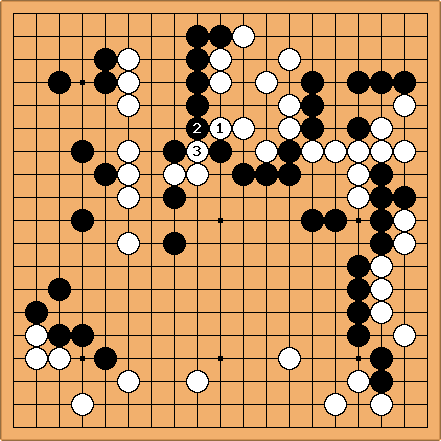 Why is this the first move a player like me and HL782 would think of, while a 9d pro will most likely see or even feel the proper move first? I'm still thinking about it, but the word "feel" plays a major role here. It seems players like us "feel" the urge to block when the opponent tries to break through our lines. The emotional level rises, as the threat of a cut is imminent. Our reaction is to strongly resist. The correct action is to give way and let the opponent's energy die in the space we've allowed it to flow into. I would suspect that this is what go professionals "feel". They - still my conjecture - instinctively use the brute force of the opponent and lead it towards their strength. The squared moves are weakly connected. The circled ones are strongly connected. When pushes in, the intuitive professional move is to use this opportunity and strongly connect the weak stones (a), not to add another move to the already strong stones (b). Moreover, after b there are two diagonal connections, while after a there are only straight ones (but a gap). The difficult part is to calculate what happens next, and notice that the circled point provides a much needed extra liberty. However, this calculation confirms the first choice. There's no reason to investigate the poorer second choice. In the game, the wrong move is played intuitively because the instinct is to be stubborn, not agile. 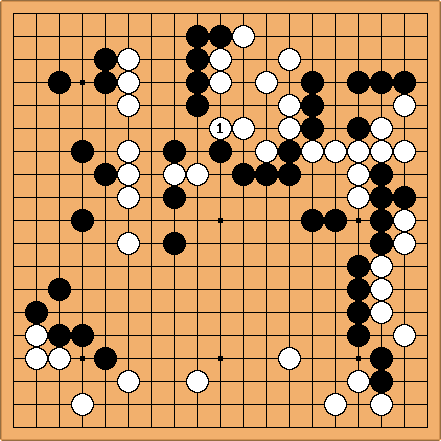 The agile option is not explored and the player resolves to a kind of despair that the "inevitable" move will still be successful by killing White's group. And this is precisely what happened. Thus, the wrong instinct to resist stubbornly has been rewarded and the proper move, following an agile instinct, becomes even more remote. How to cure? It is not easy because our fast thinking is at stake here, not our slow thinking (cfr. Daniel Kahneman). One solution is to think slowly more often, especially in intense tactical situations like these. Another, more painstaking, solution is to change the fast thinking. This should be trained by deliberately switching to proper moves making straight connections, even if they feel awkward compared to crooked connections, or by zooming in on which parts of a group are actually strong and need attention, rather than reinforcing parts that are already strong. tapir: One of the first go booklets I read was titled "train your intuition", intuition, but you can train it. I never credited it much for early progress (I thought it is all due to the proper books I read). Imo the mistake looks tempting because your basic instinct is "block the push into the keima", without noticing at least the additional Black and White stone to the left (they show in actual reading, but we may not have the intuition developed to see this connections out of jumps as sth. different than a keima). But at least there is the "enable-wedge-into-one-space-jump" shape, that should show up for tsumego-solvers. I don't really see it as a weak players diagonal, though.